Sunlit Pages: Are You an Underbuyer or an Overbuyer? This week I've been reading Gretchen Rubin's newest book, Better Than Before: Mastering the Habits of Our Everyday Lives (I mentioned it several weeks ago, but just this week, I finally had time to start it). It is so good. I might like this one even more than The Happiness Project or Happier at Home (and you know that's saying something). Perhaps it's because I've noticed how habits are inextricably linked to my own happiness, and so a book that's all about how to form and maintain those habits is just completely fascinating and interesting. One of the first things Gretchen sets out to do is help you identify your own personality style in regards to forming and keeping good habits. She does this by laying out four broad tendencies (I'm pretty sure I'm an Obliger who leans heavily towards Upholding) and then personalizing them by asking a series of questions. 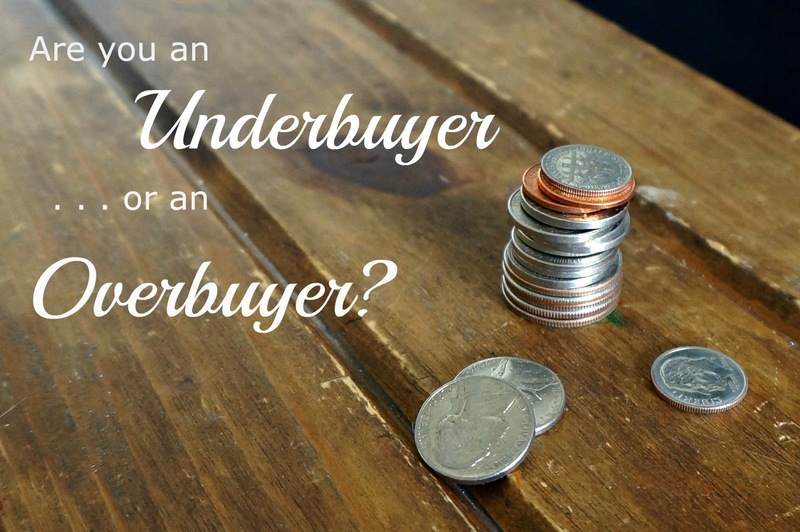 I've been thinking a lot about one question in particular: Are you an underbuyer or an overbuyer? Gretchen talked about this question in The Happiness Project in relation to the question, "Can money buy happiness?" (The answer: yes.) But she brought it up again in relation to habits because it's helpful to know if you're the type of person who will go out and buy all the latest running gear in order to make running a habit or if you're more likely to run in whatever you already have available. I am an underbuyer. No question. In answer to the running example, I run in a pair of two-year-old Nikes (that felt like a big splurge at the time), a pair of men's athletic shorts (when the weather is warm enough) and an old family reunion t-shirt. I cut a mean figure, that's for sure. Granted, I'm not that serious about running, but there are still many days when I'd like to own different running attire . . . but just not enough to actually buy any. When we go out to eat, I rarely order anything to drink besides water, and I always begrudge the tip at the end (I know! I promise it has nothing to do with not appreciating the waiter; I would just rather have the tip included in the total cost so that it doesn't feel like a decision). It's the same thing with paying a babysitter. Yes, I know she just watched my four wild children. Yes, the money was well-earned. But oh wow, it hurts to hand it over. I've been on the hunt for a new pair of sandals for summer. But I cannot get myself to buy anything. I just keep making excuses: Maybe I'll find something cheaper. Maybe I'll find something I like better. Maybe I should check the thrift store one more time. Maybe there will be a sale. Maybe I could hold out another three weeks . . . or twelve months. It honestly doesn't seem to matter if I'm spending a lot or a little, making a big purchase or a small one. Recently, I stopped in at The Children's Place because they were closing that particular location and so were liquidating the entire store. Everything was $1.99, and so I started grabbing up pants in all sizes for my boys. (Side note: people often tell me that it must be nice to have four boys because I can just pass the clothes down to the next one. That's nice in theory but totally untrue. Boys are so hard on clothes, particularly jeans and shoes.) As I was standing in the checkout line with my arms almost breaking under the weight of so many pants, I couldn't help thinking, This is going to cost so much. Yes, I actually thought that, even though I was saving hundreds of dollars. Mike, on the other hand, is an overbuyer (but a wise and conscientious one). When he was working on his doctorate and we didn't have any money, he didn't spend it. But once he had a real job, his spending habits gradually changed with the increase in cash flow. Going to Costco and filling his cart to the brim gives him a happy little thrill. It sends me to the edge of anxiety. However, the great irony is that on the rare instances when I make myself spend money on something I want or need, I actually do feel happier. Take Gretchen Rubin's book, for example. I bought it. I almost never buy books for myself (after I read Notes From a Blue Bike, I went to the bookstore to buy it. I held it in my hands and walked to the checkout counter, but once I actually got there, I told them I didn't want it). Sure, it hurt to push the checkout button on Amazon, but once it came in the mail, I was so happy to actually own it. A few weeks ago, my hair was driving me crazy. I passed the mirror, saw the gross split ends, and texted my friend on the spot. I avoid haircuts almost as much as going to the dentist. It seems like such an exorbitant cost for something that's going to grow right back . . . especially when I'm not even changing the style but just getting a trim. But oh wow, after I'd done it (and paid her and the money was gone), I was so happy. It was the best haircut I've ever had. I didn't settle for the cheapest option like I usually do, and even though I agonized a ton before I went, I didn't have a single regret after the fact. I've been turning one of our basement bedrooms into a little library (and I'm excited to show it to all of you in a few weeks!). One of the things we splurged on was a cushion for a little bench seat. I had all of these ways to save money (try to find an old couch that we could steal the cushions from, buy a foam pad and cover it myself, etc. ), but in the end, we hired someone to upholster one for us. It was such a great purchase! It was done much more satisfactorily than we could have done ourselves, and, more importantly, it actually got done, whereas it maybe never would have happened if I'd waited on myself. I think I will always be an underbuyer. And for the most part, I'm happy about that. It means that we stay well within our means and that we use what we have. But, I'm slowly realizing that there are benefits to being an overbuyer as well. Overbuyers are generous and kind. They don't keep track of how many granola bars the neighbor kids are eating, and they look forward to buying a present for a baby shower. So while I hold tight-fisted to most of my money, I'm going to make a conscious effort to relax my grip . . . just a little. What about you? Are you an underbuyer or an overbuyer? 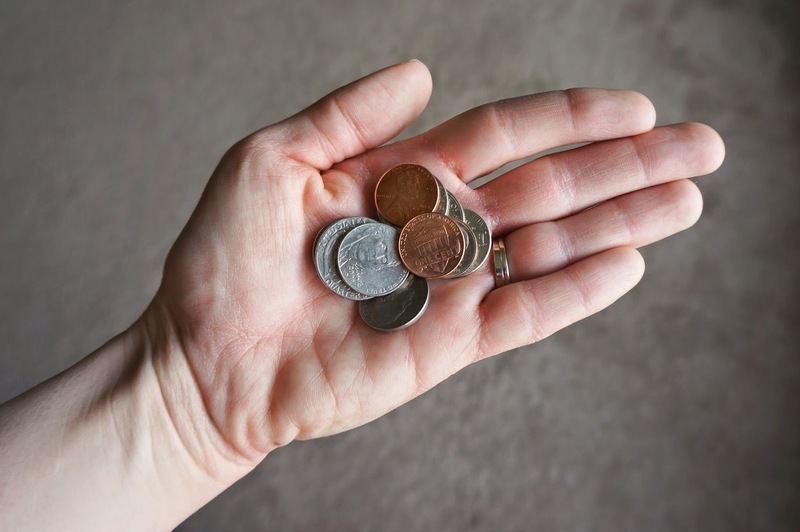 Examples of ways you spend or hoard money are welcome in the comments! I know--it's one thing to say it and another to actually make yourself do it! Just yesterday, I was at JoAnn, and I saw a pack of blank white cards and envelopes, and I thought, "Those would be so handy to have when my kids are making birthday cards for someone." I picked it up and walked down the aisle, and then I turned around and put it back with the thought that I'll just get it another time. Even though it was practical and needed, I couldn't bring myself to buy it spur of the moment like that. Such an interesting topic! I haven't read this yet but my book club is reading it next month and I'm so excited for the discussion. We are both underbuyers at our house- however, I think there is also an element of priorities. I used to judge family members for buying materialistic things (I know! I'm still growing) and then I realized we all have things that are important enough to us personally to shell out the dough. I find it much easier to spend money on activities and vacations that will build memories- others might not agree with this philosophy because you aren't leaving with something tangible. Brian will spend money on our cars that I don't see as a need- but he would argue that it is. I wish my book club was reading it! Maybe we'll have to have our own discussion via phone. Yes, the priorities question does come into play. For example, I'm definitely more willing to spend money on nice hardback picture books for my kids rather than on clothes for myself. In the book she also talks about whether you're a satisficer or a maximizer. A satisficer doesn't agonize over decisions (for example, if they have to buy new bathroom towels, they just go to the store and buy the first ones they see) while a maximizer has to explore every option before making a decision (for example, go to every store and compare the color, texture, and softness of every towel before making a purchase). Unfortunately, I'm also a maximizer, and that's not a good combo if I want to spend my money more easily. Haha, this was too funny. I found myself vigorously nodding my head in agreement to everything you said (I get my hair cut maybe once a year because I hate paying for it, I begrudge tips too, and I'm terrible at stocking up on food storage because when I go to the store, I buy what is on the meal plan list and nothing else). And my husband would also be an overbuyer, which creates a small amount of tension between us. I'm also working on loosening the reins a bit, trying not to panic when he picks up donuts or otherwise spends money that's not in the budget. Haha! My husband ALWAYS comes home with unexpected donuts too! Yeah, if you've been following her blog pretty closely, most of the info in the book will probably overlap. You might still enjoy it, but I bet you won't learn anything new. Have you listened to her podcast? I actually really like it. The dynamic between Gretchen and her sister is pretty great. I'm in the same boat, Suzanne. As a blog follower I don't know if the book could teach me any more! I'm definitely an underbuyer, and a maximizer and I didn't think I was an obliger until I took the quiz, but now I see the truth of it. Amy I've been loving the podcast! I am an under buyer also. I love getting a good deal & wish I happened upon that pants sale! When we go out to eat, I never get a drink, or appetizer or dessert. But I don't mind paying a 20% tip bcuz i feel like I'm helping someone out. Same with the babysitter. Course, we've only had to pay a babysitter twice. Same with you onthe sandals. I've been searching for a nice white pair to replace the pair I got for my wedding day, almost 11 years ago. They arent white anymore. I've been searching thrift stores with no luck. For my bday from our parents I got $75. Rob bought a bike seat for makayla so we could go on family bike rides with that money for $30. I found a brown pair of sandals for $6 at DI & a cupcake holder for $7 at smiths. So I have $32 left for sandals and maybe a necklace holder? Or a swimsuit? Or would I rather have a rash guard shirt? Most of these things I've been debating for a could years. One thing I have no problem spending money on is paying down our mortgage. I LOVE seeing the number going down! You've only ever paid a babysitter twice?! I'm jealous! Even with all the family we have close to us, I still find myself needing to hire someone about once a month. I love it that Makayla got a new bike seat with your birthday money. You're a nice mom. And as far as the mortgage goes, that probably also relates to Monitoring, which is one of the four Pillars of Habits. Gretchen Rubin says that "if [you] want something to count . . . [you] should figure out a way to count it." It sounds like you have found a way to do that with your mortgage, and because you can watch that number fall, it's really motivating to you. That's awesome! We only go out once a month or so. We often debate abt if something is worth paying a babysitter, and won't go if that's the case (joys of 2 under buyers). I felt like the bike seat was benefitting me bcuz we couldnt go on bike rides as a family if she didn't have somewhere to sit. This has been fascinating to read everyone's responses. We over buyers don't want to admit that is what we are. Ha! You do good things with your money, Vicki, so don't be ashamed of it! I'm a total under buyer. And I'm jealous... I visited Children's Place on numerous occasions waiting for the wall of pants to drop to an acceptable price in my Cheapskate mind... I hurried in first thing on the last day and all the pants were gone!! what day did you get them?! Hey, you successfully made a comment!!! I'm so glad it worked this time!!! I bought the pants on Friday, April 3rd, around 2:00 in the afternoon. :-) I happened to get too many 4T's, so you're welcome to a few of those if you need any of that size! Man, I was there Thursday and Saturday... Boo hoo. Thanks for offering the 4Ts. I was hoping to stock up on bigger sizes. I hear the Centerbille store is closing too. Maybe I will try them on the second to last day! Well, if it makes you feel any better, aside from a pair of athletic pants that were size 7, all of the other pairs were size 5 or under. So you didn't miss out on any big sizes. I'm an overbuyer; I like shopping! But I'm also pretty deliberate with my money, so I definitely wouldn't say that I'm an overspender. I save and believe in the importance of saving, but I do it with the purpose of eventually using the money to make a purchase. Overbuyer vs. Overspender - that's a good distinction! I think the important point is that you're careful with your money but you get joy out of spending it on things you love!